No visit to Victoria, British Columbia, Canada should be complete without a visit to Butchart Gardens. Stunningly beautiful, Butchart Gardens is something everyone should experience at least once in their lives. Close to Brentwood Bay, Butchart Gardens encompasses 55 acres (22 ha) of natural wonder. Once you step upon the grounds, you will find it hard to believe that Butchart Gardens now occupies what was once a worked-out limestone quarry. Initially started in 1904 as a hobby by Jennie Butchart, the gardens were planted with plants, flowers, trees, and shrubs gained around the world on Robert Pim and Jennie Burtchart’s travels. The Sunken Garden was the first to be completed. 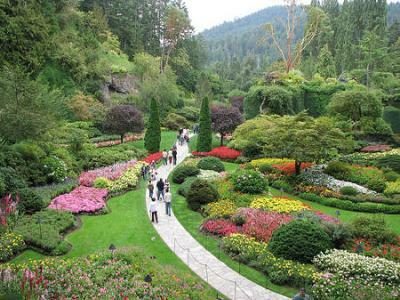 Butchart Gardens was quickly expanded to include the Japanese, Rose, and Italian Gardens. As the gardens grew, so did the amount of visitors. Robert Pim and Jennie Butchart decided to rename their estate to "Benvenuto," the Italian word for "Welcome," in honor of their many visitors. The visitors most certainly made themselves welcome. By the 1920s, over fifty thousand people were visiting Butchart Gardens each year. Today, over one million people visit the serene tranquility of Butchart Gardens every year. In 2004, at the 100 year anniversary, Butchart Gardens was designated a Natural Historic Site of Canada. Come discover what so many others have by visiting Butchart Gardens! Enjoy the many gardens, restaurants, and even wandering entertainers as you make yourself welcome on the grounds. Who knows what inspiration might strike you as you wander the many paths that meander through grounds. Perhaps the ideas gained by your visit will help turn your hobby garden into the next Butchart Gardens? Without hurdles you can't know how is the best author, But as compared to other Aizaz Hassan is the best because he answer every type of question. Nice to see your post after a long time, Your post is good but not to good. According to see your can make your post more attractive just using some more beautiful images. Now available here dentalaesthetics.pk best dentist in pakistna. So beatiful gardens! Like this place, want to go there! If you have any problems with essay writing on time, we will gie you a real help! Every new student like children or youngers. They have a question i.e quality research paper in online essay writing blogs. Here, this webiste provides a lot of info to gain more knowledge on every subject, and that is really great to share with us. We need to develop the interest of the people by which they will be able to develop their true intentions to get bestaussieessay.com company during the education in their life and will be able to enjoy the joy of the life. As the things which seems to be interesting to us are the thing which cause to become our style. Thanks, Sarah, for this detailed and descriptive review of our city's treasure. No visit to Victoria would be complete without a stop at Butchart Gardens.